Keangsaeng 88: What is it, and What do We Know? North Korea does not have a famous automotive industry, by any means. Sure, they currently have Pyeonghwa Motors that makes VW Passat copies, and builds the old Ssyangyong Chairman (which, in turn, is an old Mercedes E-Class) under license. Back in 1987, though, they probably built their most famous vehicle. And the West knows almost nothing about it. 1. It’s a clone of a 1987 Mercedes 190E. 3. 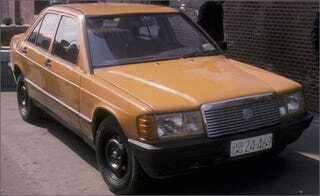 A few real Mercedes 190Es were shipped to Pyongyang, in which they were immediately reversed engineered and copied. 4. The North Koreans did a terrible job replicating it. 5. Only a few prototypes were made. 6. And it has a four cylinder gas engine, with some sort of transmission, with all of the power, however much it is, going to the rear wheels. We don’t know how many were built, we don’t know what kind of four-cylinder is in it, or where it came from, we don’t know who built it (there are differing sources), and we don’t even know what its, “real name,” is. Seriously, we don’t know what Kim il-Sung and his posse originally called the beast. Most people will call it the Keangsaeng 88, much like how I am in this article, and others will call it the Pyongyang 4.10, and a select few will call it the Paektusan. Many sources will say that the 88 lacked air conditioning, heat, and that dust would often fill up the cabin. That’s my kind of vehicle. Basic, but featuring the classic lines of Mercedes-Benz. There is often only one photo to be attributed to the Keangsaeng 88, which is posted at the top of the article. According to Car and Driver, this famous photo was snapped by Meinrad Frhr. von Ow, way back in 1989. Do not fret, there is at least one other. Sadly, we know even less about this photo. This super grainy example comes from the Flickr of, “GTO SuperSport Blog,” who also has a photo of a six-wheeled Volvo XC60 truck, a bent Estonian license plate, among other random photos, so I don’t think this mysterious GTO SuperSport Blog person really knows anything about this vehicle, but rather someone who just came across a photo of the car. Nonetheless, we can draw clues from this photo about the infamous North Korean 190E: Because of the hubcaps, I do not believe that this particular 88 (or 190E, or whatever it is) is the same as the classic orange example in the widespread photo from 1989. Also, I believe that this vehicle is at some sort of show or exhibition, due to it being on special blocks. Due to that, I would like to think that someone, or perhaps some corporation, tried to market the Keangsaeng 88 inside North Korea. In turn, I don’t really know why the Koreans would market anything because people cannot buy vehicles in North Korea. In that totalitarian state vehicles are not purchased, but instead are gifts from the party. This photo was taken in Pyongyang in 2005, and it depicts a very long line of maroon 190E’s, a lone blue 190E, two white W114 chassis Benz’s, and a black, right hand drive, Nissan Cedric. It makes no sense to me, and I shall try to figure it out in another list. 1. Why is there a long, two lane wide as-far-as-the-eye-can-see group of (when this photo was taken) 20 year old Mercedes parading through the streets of Pyongyang? They could possibly be being delivered to a bunch of members to the communist party, or they could be on the way to show off to a group of tourists, proving they could manufacture vehicles. 3. Are they even real Mercedes? If you look closely of the badging on the blue car, it does not say “190E,” or, “190D,” but rather just, “190.” As far as I know, Mercedes never produced and marketed a W201 chassis car called the 190. 4. And why have we never seen these maroon 190's again? I have always found places that I cannot go to as interesting, and I attempt to find out all the information I can about these places. Whether it be Cuba, Area 51, and especially North Korea. And through my time of searching through photos of Pyongyang, and YouTube videos of street scenes, I have never seen another maroon Mercedes 190E. Did the government get rid of them? Did they put them in storage? Where are they? There has also been speculation that the Keangsaeng 88 is even a real car. So I’m just going to leave the article at this, because the more you research this vehicle that doesn’t have a real name, a real origin, or even a real purpose, the less it makes sense.